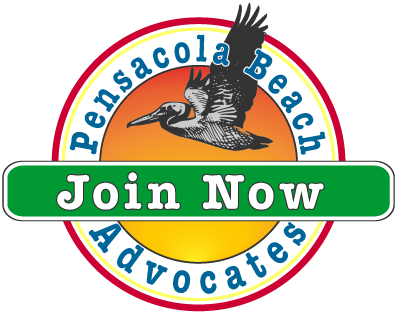 If you are a beach resident, a leaseholder a beach business owner or a friend of the beach who supports the mission of PBA, then you are eligible to be a member of Pensacola Beach Advocates. We stay informed on important issues that impact the island and you. We keep you informed through newsletters, emails and occasional meetings. We make sure that your voice is heard in the county and at the SRIA. Friends of Pensacola Beach who concur with PBA's objectives. The cost is only $30 per year for a family or business. If you own a residential leasehold on Pensacola Beach, then you have already saved $30 many times over – our PBA Board lobbied the SRIA not to increase your lease fees in 2010 by 10%. Our board of directors attends SRIA and relevant County meetings to stay informed on issues. Members are kept informed on current issues affecting the Beach through the Pensacola Beach Advocates web site, occasional meetings with informed speakers and relevant topics, and an e-mail network. Public officials are kept informed of viewpoints and positions taken by the Pensacola Beach Advocates based on the vote of the membership. Preserving our sense of community and quality of island life.